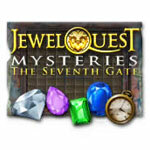 Jewel Quest Mysteries: The Seventh Gate Game - Download and Play Free Version! 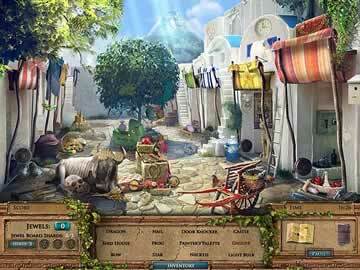 Find Hidden Objects and Match Precious Jewels as You Travel Across Greece! Welcome back to another archeological treasure hunt in this installment of the Jewel Quest puzzle-adventure series. This time, our heroes will be tromping around Greece, specifically on an island just off the coast of the mainland, finding key items, putting things together, matching gemstones together, and more! Emma comes home to find her archeologist husband, Rupert, and young daughter, Natalie, have disappeared, seemingly off to explore the island. Not one to be left behind, our heroine sets off to catch up with them! Along the way, however, she comes to realize that both of them are in grave danger. Worse, a volcano is set to erupt, so time is of the essence to Emma. If you have not played the previous entries in the series, though, don’t let that deter you! Jewel Quest Mysteries: The Seventh Gate is easy to learn, easy to understand, and easy to get into for both beginners and avid followers! Take part in challenging hidden object games! Look upon highly detailed backgrounds, both static and scrolling, to find all the necessary items among the clutter! For added variety, use previously found items to uncover others in small puzzles. Be on the lookout for other important objects, as well! Collect golden coins to purchase hints in case you ever get stuck! And search for precious gemstones to help with the Jewel Board. Don’t take too long, remember, you have a time limit. But don’t be too hasty either; clicking around haphazardly will only subtract precious seconds from the clock! 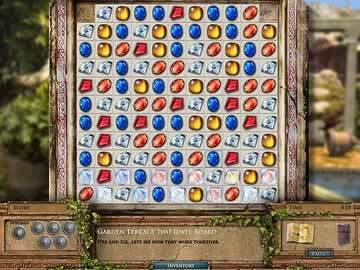 Peruse the series’ trademark Jewel Board, swap around colorful gems to earn enough points in the allotted time to advance. These puzzles get increasingly bigger and more challenging the further you go, so watch out! Make your life easier by purchasing additional powers using gems uncovered during scavenger hunts. These include the Shard Remover, which clears out gems of specific patterns, the Row Clearer that destroys an entire row of gems, and the Prismatic Jewel, to do what alchemists have only dreamt of doing for centuries: outright transforming jewels! Emma draws ever closer to her family as she completes levels and challenges. The path is not always narrow and linear, however. Sometimes, you are perfectly free to advance things in the order you would like. Stuck in one hidden objects sequence? Take a break, and see if you can buy some more hints elsewhere. Don’t want to put that map together just yet? Go ahead and play on the Jewel Board instead! There’s a lot that Jewel Quest Mysteries: The Seventh Gate has to offer. With elements from Match 3, hidden object games, jigsaw puzzles, and more, there’s no shortage of variety in gameplay to be found.